Home / Blog / Take the 100 Words Quiz! 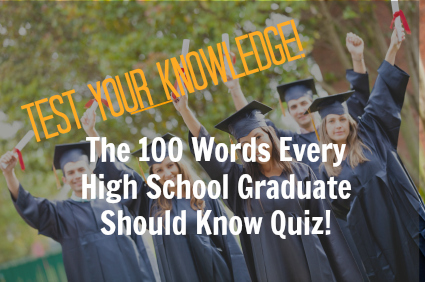 I recently posted American Heritage Dictionary’s “100 Words Every High School Graduate Should Know.” Here’s a quiz you can take to see how well you can define all 100. I’m using a new program to create and administer the quiz. I’d love to hear your feedback. If it goes well, I’ll start posting quizzes on a regular basis! Just click the link below and get started. Feel free to post your reactions and (if you dare) your scores! I got a 32% and I am only in the fourth grade. That’s an excuse for me. I’d say that’s pretty good, Kevin! I got a 32% and I am only in the fourth grade. Only 69% and I used to ace all of the Readers Digest “Word Power” quizzes! Guess it’s old age creeping in, or school is just more sophisticated than in my time B.C. – before computers. 97%, I’m not bad at this. it said i only got 69 per cent but it marked seven answers wrong, saying i had put the wrong answers when i know i chose the correct one, so i actually got 76 per cent. and i’m not lying to make myself sound better. it seriously decided to say i gave answers other than i did for seven questions. better check that out. the next most annoying thing is seeing a wrong answer when the correct answer was one you were going to choose and then didn’t. that happened a little too often too. I’ll look into that, Lynzee. Thanks for the heads up. Even without the errors, your score is impressive. Well done. I am shocked, as I thought I’d gotten at least half of them wrong. My mum and sis helped a little though. I am a homeschool graduate. 72% is nothing to be ashamed of! So, are there two Ryans or just one? I’m confused. I guess so, but it’s weird. Same name (different spelling), same score (89%) and both of you guys are in middle school still. Anyway, well done. You’ve both done better than most adults who have taken the quiz. This was fun even though I only got a 79%. 🙂 I was in a hurry when I took the quiz, so I’ll use that as a partial excuse. I hope you put more quizzes on the site. That’s a great idea. Glad you liked it, Mary. 79% is fair. Thanks for sharing your score! 75% and I’m not even in high school yet. You should post that score on your refrigerator, Paul! 92% Loved the quiz, and I learned a few words! Pat gets an A. Well done. Thanks for the input JJ. The length is all my fault. I decided to do all 100 words instead of a sampling. I can make them any length I like. I expect most will be much shorter. 80% is good. Well above the average, I would think. I didn’t want to trick anybody, but I wanted to make it hard to guess too. 70% is a good score, CJ! 85% and English is my second language! 😀 yeah me! Hold your head high, Nancy. Anything above 70% is pretty strong. Heck, I missed 2 and I made the quiz!